Everything is going well, you are learning something new, you feel great, you’re leaping further than you ever had before, nothing is going to be able to stop you. There is an added excitement because perhaps you’ve had to purchase some new “things” to get going on it so you feel even more like a pro at what you are doing. You are now gliding through the basic learning paths and tutorials, make hay of anything that comes your way. Not only are you doing well but people are starting to compliment your work and you are starting to focus on more complicated problems. “I Got This” is total euphoria, you feel like you are on top of the world because on a scale of 1 to 10 in Roadblocks, you have encountered 0. The longest period in learning is “Wait What?” – this is period starts on a sharp decline marred by frustration. All the euphoria that you had from the previous two stages are now a combination of simple things that you think you should be able to do taking an excruciatingly long amount of time or you are trying to avoid them altogether making excuses for why you haven’t done anything. This stage feels like you are starting to go backwards, you can’t figure out what you want to do or how do it and nothing is coming out right. Of all the stages, this is the hardest one because it is here that we’ve hit a small plateau of where our natural abilities can take us and now the required extra effort is required to get us to where we want to be, to where we feel we should be by a certain point in arbitrary time and to where we eventually want to go. The only way to proceed through “Wait What?” is to accept where you are and keep pushing through. If you keep pushing through you’ll be able to make it to the final stage, but if you can’t, you’ll be stuck in “Wait What?” forever, wondering how you got here, how you are going to get out and why did you ever do this frustrating thing in the first place. 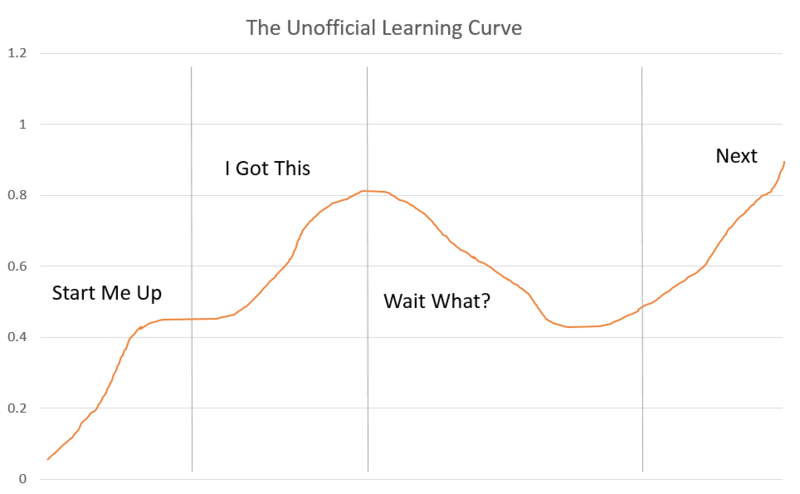 Next is the last stage of learning, but it’s not the end, it’s a bookend because you’re not done, you’re never done – and the real masters know they need to keep learning to keep getting better because there is always something new to learn. The ones who make it to Next and complete this stage are willing to go back to “Start Me Up” and go through all those feelings again to keep getting better and better. Again, not official, but a graph describing the process as illustrated below. Think about something you just spent a lot of time learning, was it similar to this? Easier? Longer?